The CEO of Boeing has the ear of President Trump. Once a target of Trump's Twitter ire, the company has risen to significant influence inside the Trump White House. "We've got a voice at the table," chief executive Dennis Muilenburg told media and company analysts last month. 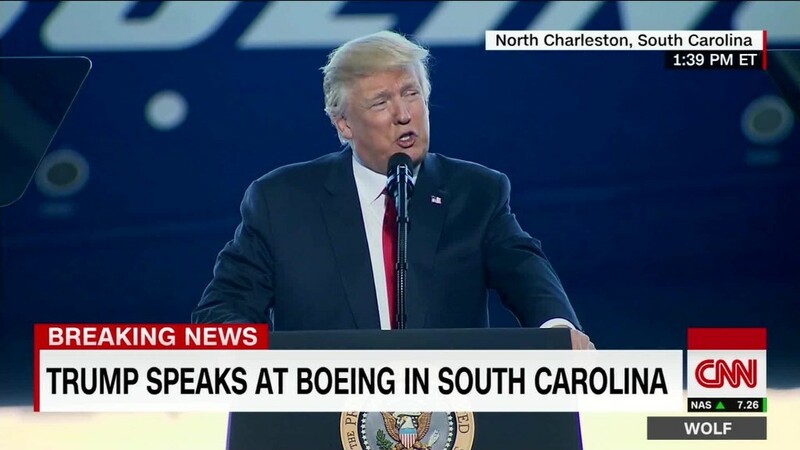 On Friday, Trump will be the first sitting president to visit Boeing (BA)'s fast-expanding campus in North Charleston, South Carolina, where he will attend the unveiling of Boeing's new 787-10 Dreamliner. It will be the third meeting between Trump and Muilenburg since the president's election. They had previously met at Mar-a-Lago and Trump Tower before the inauguration. They have spoken on the phone about a half dozen times, according to people familiar with the calls. "We've had the privilege of having a very open dialogue with him on business issues," Muilenburg said on the earnings call. He said Boeing is "very supportive" of Trump's plans on manufacturing, trade, regulation and taxes. The company is "very confident that those are headed in the right direction and being done with the right tone and tenor." In the less than four weeks since taking office, Trump has moved closer to Boeing's interests on several key issues. The president has declared his support for the U.S. Export-Import Bank and reaffirmed a "one China" policy. His press secretary has signaled the administration will likely support U.S. expansion plans by Norwegian Air Shuttle -- despite the objections of U.S. airlines and their unions. Norwegian Air is a big buyer of Boeing planes. There are still major issues on Trump's agenda without resolution that affect Boeing, including tax reform and whether or not to review a treaty that allows airlines in Qatar and the United Arab Emirates unfettered access to the U.S.
Boeing CEOs often work closely with presidents. Muilenburg's predecessor chaired President Obama's Export Council -- but Muilenburg's access to Trump has been extraordinary for a corporate leader. During his January 17 visit to Trump Tower, Muilenburg was allowed to listen in to part of a call between Trump and Lt. General Christopher Bogdan. Bogdan is responsible for the Pentagon's F-35 Joint Strike Fighter program. The F-35 is made by Lockheed Martin (LMT) and is a competitor of Boeing's F/A-18 Super Hornet. At the time of the call, Trump was threatening to buy Boeing Super Hornets as leverage against Lockheed in pricing negotiations for 90 F-35s. Bloomberg News first reported details of the call. Bogdan, testifying to Congress on Thursday, downplayed the significance of the call. "There were no decisions made during those conversations, and it was my belief that President-elect Trump at the time was attempting to gain more information about the F-35's capabilities, relative to the Super Hornet," Bogdan said. Boeing's contacts aren't limited to the Oval Office. Boeing staffers have had numerous meetings with Defense Department and White House contacts at all levels in recent weeks, according to one of the familiar people. From their first meeting on December 21 in Mar-a-Lago, Muilenburg has been effusive in his praise of Trump's agenda. Muilenburg told reporters: "It was a terrific conversation. Got a lot of respect for him. He's a good man. And he's doing the right thing." Boeing, like many companies, woke up on November 9 to an unexpected political landscape. The company had been preparing for a Clinton presidency. Timothy Keating, its long-time senior VP of government operations, served under President Bill Clinton. There was even internal discussion at Boeing that Keating might join a new Clinton administration, according to several Boeing staffers. Early on, some of Trump's policy pronouncements unnerved Boeing. Trump took a congratulatory phone call from Taiwan's president and risked disrupting business relations with China -- Boeing's biggest single jetliner customer. Boeing was then blindsided on December 6 when Trump tweeted, "Boeing is building a brand new 747 Air Force One for future presidents, but costs are out of control, more than $4 billion. Cancel order!" Trump scolded Boeing on the new presidential transport. "I think it's ridiculous," Trump said. "I think Boeing is doing a little bit of a number. We want Boeing to make a lot of money, but not that much money." Within hours, Muilenburg was on the phone with Trump for the first time, congratulating the president on his election win, committing to control the jet's cost and extending an invitation to Trump to visit its factories, according to one person familiar with the call.